Re: Remembering the key: BBb? If the instrument you played was bigger and fatter than the BBb tubas you see on the market these days, then it was definitely a BBb. BBb's are the biggest and fattest of them all, or at least some of them are. The picture above shows a Holton BB-345 (left) next to a Conn 20J. For scale, the Holton's bell is 20 inches, and the instrument is 39" tall. Both are large instruments. But all tuba music is "unedited". All tuba players (with one exception not important here) play music written in concert pitch in the bass clef. With a BBb tuba, the G on the bottom line of the staff is played 1-2. On an CC tuba, it's open. On an Eb, it's also 1-2, and on an F, it's 4. 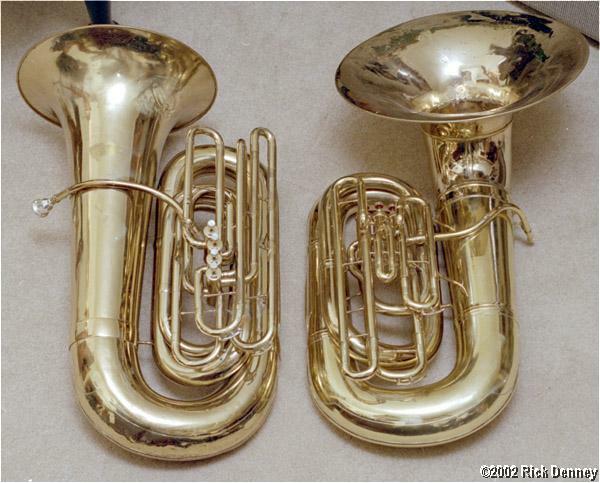 If you learned on a BBb tuba, then BBb fingerings are the ones that will come back to you when you start playing. It's therefore the one that will make your return easiest, and that's why we recommended it. If you played both a tuba and a sousaphone, and both were the same, then your only possible choices are BBb and Eb. There are no CC or F sousaphones. I daresay there were few enough high schools still possessing usable Eb sousaphones even 30 years ago, and far fewer who had players actually using them. 50 years ago would be another matter. The clues tell me pretty conclusively that you played a BBb.